If you thought launching a drone from an aircraft carrier was impressive, you're going to be blown away by this: After six years of development, the U.S. Naval Research Laboratory has successfully launched a drone from a submerged submarine. That's right. A submerged submarine. Submerged under the ocean. The picture above is real: a composite of time-lapse photos taken during the launch. You can see the wings swing out like a pair of scissors as the drone takes to the sky. The U.S. Naval Research Laboratory really outdid themselves this time. 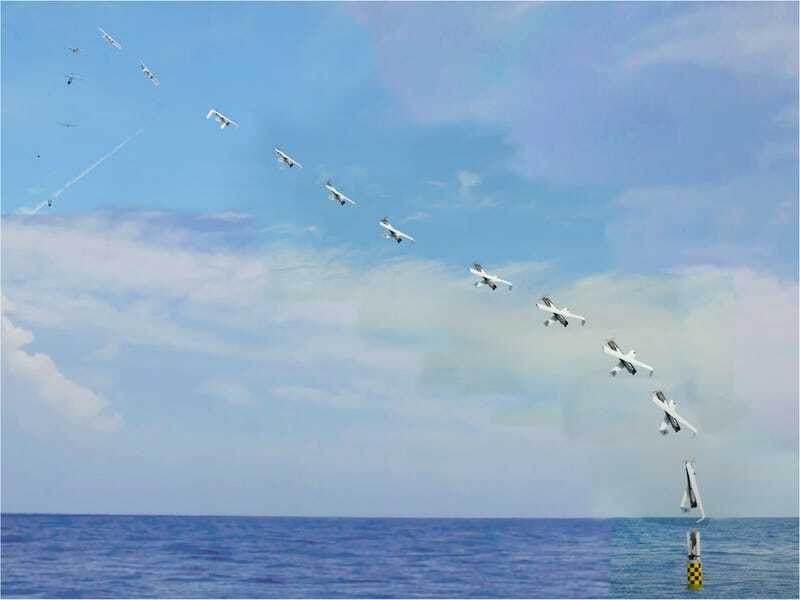 Their Experimental Fuel Cell (XFC) unmanned aerial system was just fired from the torpedo tube of the USS Providence. The so-called Sea Robin launch vehicle system then floated to the surface, where an all-electric, fuel cell-powered drone with foldable wings took to the sky where it performed an hour-long test flight before landing at the Naval Sea Systems Command Atlantic Undersea Test and Evaluation Center (AUTEC) in the Bahamas. Pretty cool, huh?